MEMO - Top Hollywood bosses enjoy a strong relationship with the Israeli government and various pro-Israel lobbying groups across the United States, according to a cache of Sony internal emails leaked to Wikileaks and published for the first time last week. The emails reveal a dinner between Sony executives and Prime Minister Benjamin Netanyahu; the presenter of American X-Factor chiding actress Natalie Portman aggressively for her views on Israel; meetings between top entertainment chiefs and the Israeli consulate-general; close ties between Sony's Co-Chairperson and various pro-Israel lobbying groups; and film chiefs planning, in detail, a new documentary about the rise of anti-Semitism in Europe, about which the emails also reflect rising concern. Amy Pascal, Co-Chairperson of Sony Pictures Entertainment from 2006 until 2015, was signed up to regular email updates on the security situation in Israel, from a right-wing pressure group called The Israel Project. The group was described by Jewish Daily Forwardin 2010 as a Zionist group which, "Stokes Fear of Islam for Political Profit." The Israel Project has been admonished by the more liberal pro-Israel lobby group J-Street for taking a pro-settler stance. The daily emails sent to Pascal by The Israel Project had subject lines like "Protect Israel from a Nuclear Iran", "Fighting Anti-Israel Hate" and "Hamas Agrees to Ceasefire then Breaks It, Again". Most of the emails, which were being sent as often as once a day, contained requests for financial donations. Pascal also received an email from the Anti-Defamation League, an anti-Semitism watchdog with close links to the Israeli government, thanking her personally for being amongst eighteen entertainment executives whose names were displayed prominently in an ADL advert in Variety, The Jewish Journal, and The Hollywood Reporter. The advert quoted Golda Meir from 1957: "We can forgive them [the Palestinians] for killing our children. We cannot forgive them for forcing us to kill their children. We will only have peace with them when they love their children more than they hate us." The quote was prefaced with additional commentary from ADL: "As talk turns to the future of Gaza, these haunting words of Golda Meir are as current as today's headlines. She could have been talking about Hamas." Another leaked email exchange shows Pascal, who has since left Sony, being invited to "an intimate salon style discussion" at a J-Street supporter's home, in August 2014. The email emphasised that a special guest would be in attendance, J-Street President Jeremy Ben-Ami. Pascal declined the invitation as she was on holiday in Vietnam, but responded, "I'm in for next steps and want to know how to get myself educated [sic]." J-Street bills itself as a "Pro-Israel, Pro-Peace" organisation and is regarded as the liberal element of the US pro-Israel lobby. Another email that Pascal received and responded to shows an organisation called Creative Community for Peace, "a group of influential music execs... which battles the BDS movement... which tries to stop artists performing in Israel" reminding Pascal that they had taken her and her husband on a trip to Israel back in 2007. "At that time," wrote David Lonner, a top Hollywood executive and Advisory Board Member for CCP, "the war with Hezbollah had just ended and our community had exhibited a great deal of apathy and some ignorance on what Israel was up against." Lonner added: "My hope in the end, was that if there was another crisis, we would not be silent. 7 years have passed since our trip and tragically we are in another crisis with Hamas." Pascal and her husband Bernard Weintraub also received a personal invitation to attend a private event in September last year with the Israeli Consul-General, according to another email in the leaked archive. Held at the home of media lawyer and marketing tycoon Michael Kassan, the event was billed as "A Special Briefing on the Situation in Israel by David Siegel, Consul General of Israel in Los Angeles, and Jay Sanderson, President and CEO of The Jewish Federation of Greater Los Angeles." The evening included "cocktails and hors d'oeuvres," and guests were advised to wear "Business Casual Attire." Another top Sony executive, Michael Lynton, was also emailed by Israeli intelligence operative and veteran film producer Arnon Milchan, arranging for him to have an "intimate dinner" with Prime Minister Benjamin Netanyahu. The dinner was later held at Milchan's private home in Malibu. One of the most extraordinary exchanges in the leaked emails came as Hollywood executives discussed Ken Loach's call for "a complete cultural boycott of Israel". "Enough with this pathetic limousine liberals ignorant bs," responded Ben Silverman, Executive Producer of hit shows like The Office, Ugly Betty and The Tudors. "with a wife, daughter, mother or sister knows the evil anti woman rhetoric of the sharia Islamists and it is time to draw attention to the fact that you can have a voice and a choice in our democracies and you can have nothing but hate in their monarchies and dictatorships who thrive on censorship that would never allow their works to be shown. Let's go gents. We can't lie down. We must stand up." Hollywood star Natalie Portman is copied on the email. She complained that she doesn't want her personal email address shared with a group of people she doesn't know. Ryan Kavanaugh, a well-known producer, reported billionaire and Variety magazine's 2011 "Showman of the Year," then reproached her sarcastically. "Sorry. You are right jews being slaughtered for their beliefs and cannes members calling for the boycott of anything Israel or Jewish is much much less important than your email address being shared with 20 of our peers who are trying to make a difference. my deepest apologies. I know that you don't care so I'll leave it alone, but I had lunch yesterday with Israel consulate general who brought J street up to me. He was so perplexed confused and concerned when he heard you supported them that he begged me to connect you two. I told him how you felt, you didn't want to hear from or speak to anyone who disagrees with your position. Three times he said "buts she's Jewish and smart." Just thought you should know"
"How about we all club together and make a documentary about the rise of new anti-Semitism in Europe I would be willing to contribute and put time into it if others here would do the same. Between all of us I'm sure we could figure out a way to distribute it and get it into places like Cannes so we could have a response to guys like Loach. Perhaps we try to use it to rally support from film communities in Europe to help us distribute it there." Copied in on the email are dozens of Hollywood names, including Natalie Portman and fellow actress Scarlett Johansson, executives at Lionsgate Productions, MGM and Fox, X-Factor presenter and producer of "Keeping up with the Kardashians" Ryan Seacrest, and several high profile actors' agents. One unidentified executive called the proposed documentary "A brilliant idea." Also copied is Amy Pascal of Sony, who writes "Me too," in response. Jason Binn, the owner of luxury shopping website Gilt, then offered to promote the film to its nine million members and the three million readers of his luxury magazine DuJour. Glenn Feig, owner of the entertainment law firm Reder and Feig, offered pro bono legal services for the planned documentary, before copying in his client Ram Bergman, producer of the upcoming Star Wars Episode VIII and Star Wars Episode IX, and the thriller Looper, which starred A-Listers Bruce Willis, Emily Blunt and Joseph Gordon-Levitt. Also copied in on the email discussion about the upcoming film is Elliot Brandt, who was named in September 2014 as National Managing Director for the America Israel Public Affairs Committee (AIPAC), a pro-Israel lobbying and political financing organisation. 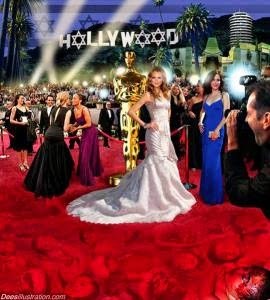 The emails reveal anxiety amongst the predominantly Jewish film executives regarding the rise of anti-Semitism. One round-robin email, sent out by Bart Rosenblatt of Code Entertainment, is entitled "Too close to home." It details a hate crime at Emory University in October 2014 in which swastikas were scrawled onto a Jewish fraternity house. Executives also emailed each otherarticles from The Guardian newspaper saying that anti-Semitism "was at its worse since the Nazis", and an article claiming that Germany is now a no-go area for Jews. "We can continue to be silent and pretend this isn't happening because it is not in our country yet. We can ignore the anti-Semitism akin to pre ww2 Germany... now lining the streets of London, France, Germany and around the world. We all may think we're protected here in the free US. We are not. It had now hit our doorstep and yet we remain silent?" "many lines are being crossed ... it's a new reality for us. The tacit and subtle recognition of Hamas as a legitimate government with legitimate policies and a legitimate charter, by Western governments is a hate crime on a global scale"
"In the UK as you well know there has been a shocking rise in anti-Israel and anti-Semitism on university campuses here, both in terms of faculty and students and student orgs such as the potent and powerful NUS ( Natl Union of Students which holds great weight within the natl. Labour Party ). The NUS has a long history of anti-Israel leadership and policy and their rhetoric and policies have become much more aggressive in the last year or so ... The intimidation of Jewish students, and those who support Israel in UK universities both by administrators, faculty and students is widespread, commonplace and alarming ... it's a dire situation and quite shocking in a nation which prides itself on tolerance and civility." Those working on the anti-Semitism documentary also discussed who should present the film. One producer said that the project would need "a really good director who on the face of it doesn't seem completely biased, so that we can show something that gets the message across without making it seem like propaganda." "I think we will get full cooperation from the impt media in europe, the eu, the current conservative govt. in the uk, the current govt in france, angela merkel in germany, many academics ( def at Oxford, Cambridge, LSE ) and of course, major jewish orgs in the uk france germany and in most eu countries ... This documentary is an essential tool for spreading our message." Please follow on Twitter @AlastairSloan for more updates.